US oil prices have continued to rise, hitting record highs on fears over threats to supplies in Iraq and Russia. The price of light, sweet crude reached $44.28 a barrel in New York, four cents up on Tuesday's high of $44.24. The rise followed warnings from oil producers' cartel Opec that it was unable to raise output to cool prices. Attacks on a major Iraqi oil pipeline, combined with concerns over possible breaks in supplies from Russian oil giant Yukos, fuelled fresh uncertainty. In London, the price of a barrel of benchmark Brent crude oil rose to $40.82, after hitting a closing high of $40.64 on Tuesday. Analysts said UK motorists should expect to see petrol price rises by the end of the week. Wednesday's oil price rise also hit stock markets across the world. Japan's Nikkei 225 index closed down 1.2% while UK and other European markets were down by 0.5-1.5% in late trading. US shares were also modestly lower. Oil prices could touch $45 a barrel in the coming weeks, according to international economist Julien Seetharamdoo of consultants Capital Economics. 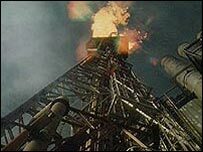 "The oil market is spooked because of a lack of spare capacity, but so far production has kept up with demand," he told BBC News Online. 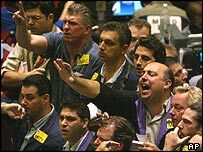 "We may see new record highs in the weeks to come, but we are still expecting a substantial fall in oil prices by the end of 2004 or early 2005." Opec president Purnomo Yusgiantoro said on Tuesday that oil prices had reached "crazy" levels and the organisation was powerless to cool the market. "There is no more supply," said Mr Yusgiantoro, who is also Indonesia's energy minister. High prices are underpinned by soaring demand from the fast-growing Chinese economy and economic recovery in the US. The cost of oil is sensitive to any development which could affect the global supply situation, such as instability in the Middle East or warnings of possible terrorist attacks. On Tuesday, saboteurs blew up an oil pipeline that supplies Iraq's main refinery and feeds the country's main northern export line. Meanwhile, at the start of the week, financial institutions in the US - including the New York Stock Exchange and the World Bank in Washington - were warned by the US government that they were targets of Al-Qaeda-inspired terrorists. The price of oil has risen by more than a third since the end of 2003, on concerns that accelerating global demand has left supplies overstretched. Allowing for inflation, prices are close to the level hit during the 1973 Opec oil embargo, and just over half the level reached during the oil price shock that followed the Iranian revolution in 1979. "The oil price these days seems umbilically linked to the newspaper headlines"